As career services professionals, we’re often in the unique position of collecting data that answers some questions about the value of higher education. It is our responsibility to collect that data ethically, accurately, and responsibly. Collecting data, however, is never enough. We must tell the many-faceted stories of our students’ successes post-graduation before someone else tells them for us. There are so many college rankings out there already—and new ones emerging all the time—in addition to initiatives like the College Scorecard. They don’t necessarily rank schools but intend to provide us with a more comprehensive picture. If institutions aren’t making the transfer from data collection to storytelling, there is a possibility that the only story prospective students, current students, alumni, boards, legislators, and the many other stakeholders for an institution will hear is the one others are telling. As a career services office, you may not feel you have a particularly strong influence on your institution’s story. Maybe your budget is limited or perhaps your resources dedicated to communication may not feel adequate. You may think you don’t have a very good story to tell because your data doesn’t feel “good enough.” Many of us struggle with such challenges associated with telling our story. But we must rise to the challenge. 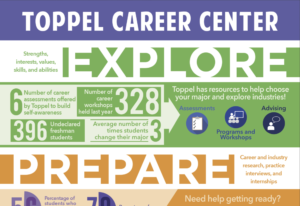 At the Toppel Career Center where I work, for example, we rely very heavily on student interns. 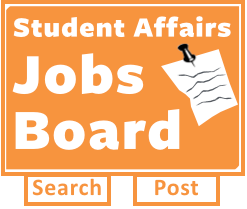 This includes a student communications team consisting of two graphic designers and a social media intern. These students work a combined 45 hours each week implementing a communications strategy. With work-study and other aid programs, this significant chunk of time turns out to be relatively inexpensive. One of my roles is to ensure that they are receiving a steady stream of data. They can then use it to create infographics, infuse into event advertisements, or post on social media. We also intentionally think beyond our own center. We consider how the data we have and the story of our students fit into the larger picture of the University’s story. Instead of just sending data to other departments, we do our best to meet in person and talk about it. Besides providing a deeper understanding of the data, we discover what other departments need that our data can fill in. For example, a school or college’s career outcomes might be lower than the University’s average. We often share data on the outcomes percentage for students who used our center or those with multiple internships, both with a higher percentage. Whatever your resources, spend time as a staff thinking about the story you want to tell. Then, make sure you have the data you need to tell your story. Just as importantly, build relationships across campus to learn how you fit into the larger institutional story. Make sure your data collection and storytelling practices align. Move your data beyond cells in a spreadsheet and into the minds—and hearts—of the people that matter. Brian Reece (@brianjreece) is the Associate Director for Assessment & Communication at the University of Miami’s Toppel Career Center and an Adjunct Lecturer for Lifestyle and Career Counseling at UM. Brian earned an Honors Bachelor of Arts in English and a Master of Education in Higher Education Administration from the University of Delaware. He also earned a post-master’s certificate in Nonprofit Management and a Master of Education in Counseling, Family, and Human Services with a graduate specialization in Prevention Science from the University of Oregon. Brian is currently the Vice Chair of Scholarship for the American College Personnel Association’s Commission for Social Justice Educators and a reviewer for the Journal of Critical Scholarship on Higher Education and Student Affairs.